MOSCOW, February 22. /TASS/. 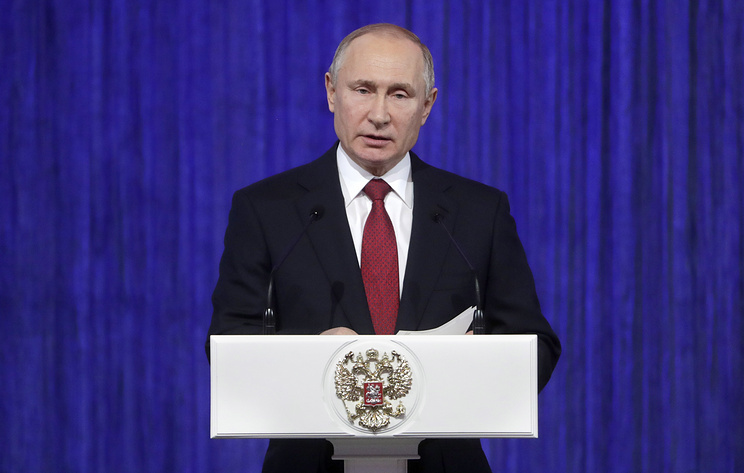 There will be no analogs of Russian weapons in the world in the foreseeable future, Russian President Vladimir Putin said on Friday at the Grand Kremlin Palace ahead of the concert in celebration of the Defender of the Fatherland Day. "You know that we prioritize equipping our army with the most modern weapons, control and communication systems. Our prospective weapons do not have any analogs in the world, at least for now, and I think that they won't for a long time," Putin said. He added that this is the result of the state's systematic and targeted measures, as well as of the tireless work of scientists, constructors, defense industry. Putin says his calls for US to calculate range and speed of Russian weapons "not a threat"
"Their unique achievements represent the basis for successful development of the army and the fleet in future decades, as well as for security and peace for Russia, for our successful and dynamic development," he noted. "Russia is a peaceful country, and we conduct responsible foreign policy and strive for strengthening international stability," Putin said. "We will continue further strengthening the country's defense potential, developing and upgrading the Armed Forces," he added. The Kremlin understands that "the modern world is complicated and contradictory, and still has many inresolved conflicts,challenges, threats," the president noted. "That is why ensuring the security of Russia, of our citizens, remains top priority for us," Putin stressed. The Russian president reminded that over the last years the combat capability of the Russian military has improved considerably, as evidenced by large-scale military drills and anti-terrorist operation in Syria. "When liberating Syria from bandits and saving civilians, our servicemen acted bravely, decisively and effectively. They showcased their best qualities while fighting in Syria and defending the interests of our country, interests of Russia," Putin said.